Lenticular sclerosis or nuclear sclerosis is the medical term for a bluish transparent "haze" that develops in the lens of the eye in middle-aged to senior dogs. This is considered a normal change in the lens associated with aging, and is observed as a cloudiness or bluish discoloration on the pupil. "Vision does not appear to be significantly affected in dogs diagnosed with lenticular sclerosis." Vision does not appear to be significantly affected in dogs diagnosed with lenticular sclerosis. This condition is not the same as cataracts. Cataracts are white and opaque and represent a change in the ability of light to penetrate to the retina. Cataracts cause diminished vision. Cataracts and lenticular sclerosis are two of the most common eye problems seen in dogs over the age of 9. Some estimates show the prevalence of lenticular sclerosis or cataracts at 50% in dogs over nine years of age and 100% in dogs over the age of thirteen. Lenticular sclerosis typically occurs bilaterally (in both eyes) and symmetrically in dogs. Clinically, nuclear sclerosis appears as an evenly gray, rounded opacity in the center of the lens, and is most easily observed when the pupil is dilated. The opacity is often more dramatic when viewed from the side rather than from the front. 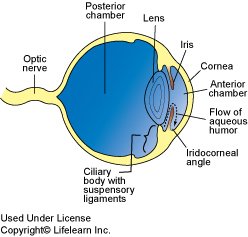 When the eye is examined with an opthalmoscope, the retina andfundus (back of the eye) can still be seen through the sclerotic lens. While the exact mechanism is poorly understood, it appears that the lens gradually becomes harder with age. Lens fibers are produced throughout life, but the lens does not become bigger. It is believed that, as the central lens is compressed by new fibers deposited on the outer "rings" of the lens, the compression leads to hardening and lens opacification. Will my dog get cataracts? Many dogs do develop senile cataracts after having lenticular sclerosis. While the two seem related, there does not appear to be a causal relationship. This means that not all pets with lenticular sclerosis will develop cataracts. Senile cataracts form when the aging lens fibers degenerate. It is important to note that senile cataracts develop in many older pets so the chances of your pet developing lenticular sclerosis and/or a cataract is high. How is lenticular sclerosis treated? There is no specific treatment for lenticular sclerosis, nor is treatment necessary. Pets diagnosed with lenticular sclerosis should be evaluated regularly to monitor for the development of cataracts. If a cataract develops, it can be surgically corrected, and this procedure should be pursued early in the course of the disease for best results.